Is this spiritual gift authentic, and if so, how does it function within Messianic Judaism? When Yeshua reiterated these words from Hosea, did he mean that the end of the Temple and the sacrifices had come? Step back in time and read the story of Messianic Judaism’s faltering first steps under Levertoff and Poljak. In November of 2014, the Caspari Center in Jerusalem invited Boaz to participate in a panel discussion titled “Four Different Views on Messianic Judaism.” Read more about it here. Part 3 of 3: The controversial spiritual gift of tongues points toward a revelation of the kingdom. The kingdom of heaven will be universal, incorporating every nation, tribe, and tongue, so we should not be surprised if the kingdom occasionally manifests in this current age in the form of spiritual gifts like “speaking in tongues” and the gift of languages. To understand these gifts and their proper role, we must first understand their context in Judaism and the first-century world. Where do you stand on speaking in tongues? In the continuation of this series, Jacob Fronkzak discusses the fourth of the five Solae—five Latin phrases that summed up the sixteenth-century Protestant Reformers’ self-definition in contrast to certain doctrines of the Catholic Church and that continue to shape Protestant theology today. Solus Christus represents an attempt to center the concepts of atonement, forgiveness, and justification on the person and work of Jesus Christ. The final task for the Messiah will be to restore right order to the world and cause Israel’s light to shine brightly to the nations. In this in-depth, and well-researched article, Toby Janicki’s offers a kingdom-perspective on Jewish identity today, and the role of the chosen people in the fulfillment of the mission of the Messiah. Do Yeshua’s teachings about love and grace supercede God’s instructions about sacrifice? When Yeshua reiterated these words from the prophet Hosea, “I desire mercy, and not sacrifice”, did he mean that the end of the Temple and the sacrifices had come? Because of the themes of "love" and "mercy" in Yeshua's teachings, readers of the Gospels might come to the conclusion that he had little regard for the Temple, the Levitical priesthood, and the sacrifices at all. But is this so? Aaron Eby diggs into the Scriptures and several other sources and brings out a Jewish perspective on the matter. An introduction to a new prayer meditation composed by Vine of David for the whole Messianic movement. The prayer was compiled from several New Testament passages and translated into Hebrew by Aaron Eby. Its importance goes beyond simply stating our common convictions, however. Hareini Mekasher helps Messianic Jews and Gentile believers to spiritually connect to HaShem prior to praying, studying the Scriptures, or celebrating any Sabbath or holy day. An exciting new Vine of David biography about one of Messianic Judaism's founding fathers. Part 4: Bram: The Life and Wisdom of Messianic Jewish Pioneer Abram Poljak in His Own Words. Partings: How Judaism and Christianity Became Two, by Hershel Shanks. Publisher: Biblical Archaeology Society, 2013. 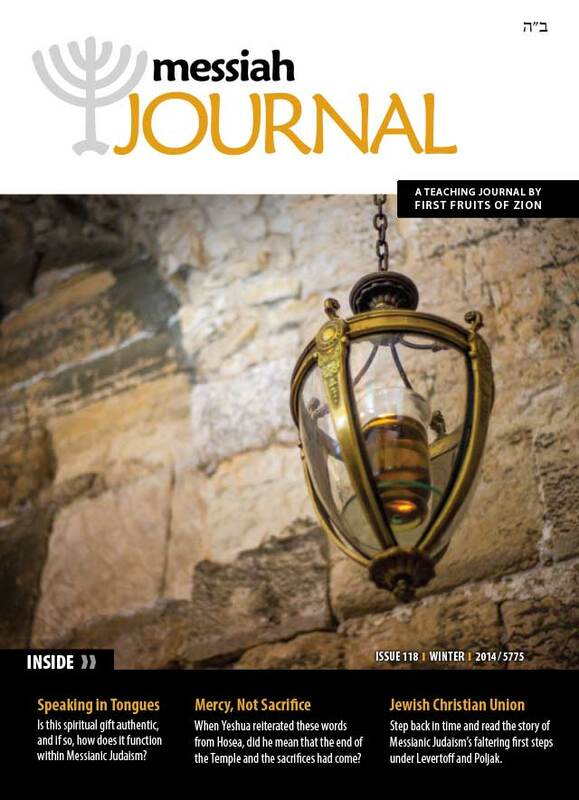 Journal of the Jesus Movement in Its Jewish Setting: A new scholarly journal on the Jewish background of the early believers, published by Eisenbrauns. NIV First-Century Study Bible: Explore Scripture in Its Jewish and Early Christian Context. With Notes by Kent Dobson. Publisher: Zondervan. The Jew Named Jesus: Discover the Man and His Message. By: Rebekah Simon-Peter. Publisher: Abingdon Press.